How dare you, touch my alpha channel! Why can’t graphic applications get their channels right? [Updated 11 May 2005] Read at the end of the article. I’ve been on a quest to improve a skin today and to do so I needed to extract a big archive in a proprietary and not widely supported format and get the images out of it and into the skin. Turned out the first part was not as bad as I expected as I’ve found some tools on the net to do this and Kris helped with the tool to convert the images in the proprietary format into TGA’s. Now here’s where the pain begun. Turns out Adobe still haven’t got their TGA support fixed (which was why I added the quasi-PNG-support to SkinStudio in the first place). If you’re not familiar with the problem, Ive wrote an article about it before and it’s available here. As you can read here Adobe actually considers the current one a proper behaviour and the one that we enjoyed in Photoshop 7.0 is considered an “incompatibility with some existing workflows”. I’ve tried a number of other apps including IrfanView, xnView and SageThumbs but they just couldn’t chew it. So before I’ve lost what was left of my nails, I’ve decided to write a little Applet that turns 32-bit images (be those TGA-s or BMP-s) to PNG-s so that I can actually do something with them before making them into a skin. But because a lot of skinners have troubles going the other way, and it was only like a few lines of code, I’ve also made one for the other format. 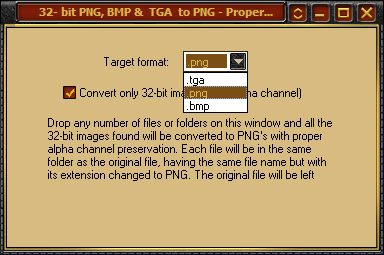 This one takes any 32-bit BMP or PNG and turns it into a TGA. [Updated 11 May 2005] It could get confusing for others just like it got for me, so I’ve integrated the 2 apps and added saving to 32-bit bitmaps. 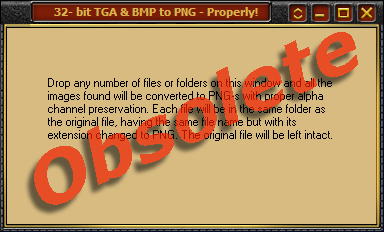 I have also added the option to include or ignore images that are not 32-bit. Now this updated applet is available here. Have fun, and make the cool skin coming! This entry (Permalink) was posted on Wednesday, May 11th, 2005 at 1:29 am	and is filed under Desktop Customization, Downloadable, Skinning, Software Development. You can follow any responses to this entry through the RSS 2.0 feed. You can leave a response , or trackback from your own site.